Nanotechnology has made significant progress in the past 20 years. Particles as small as 3 nm are being employed in restorative materials in attempts to improve their functional performance. There are currently many commercial brands with different particle size distribution; some of them are termed nanohybrids, where nanoparticles (minimum size ~3 nm) are associated with particles larger than 100 nm. Materials called nanofill contain nanoparticles with a more even distribution (smaller than 100 nm). Amongst the particles used, some of them are applied to enhance the material’s bioactivity, which may control or reduce viable bacterial count on the tooth surface or on the tooth–restoration interface. Some examples of those particles are titanium dioxide (TiO2), chlorhexedine-hexametaphosphate (CHX-HMP) and silver (Ag). Nanofillers are also used to improve the material’s clinical performance, by either strengthening the restoration or enhancing its aesthetic characteristics, such as translucency and polishability. Zirconium dioxide (ZrO2), colloidal platinum and zirconia–silica nanoparticles are examples in this category of nanofillers. 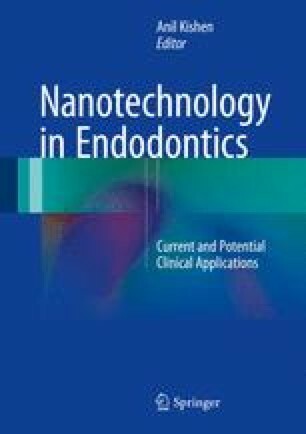 Amongst the desirable characteristics of nano-based restorative materials are higher mechanical properties; enhanced ion release of glass ionomer cements; development of bioactive adhesives, to provide antibacterial effect within the restoration or at the tooth–restoration interface; polishability and stable optical properties of resin composites; phase stability of high–crystalline content ceramics and lesser chipping of dental porcelains. The main goal of this chapter is to provide an overview of the advancements in the field of restorative materials with the application of nanoparticles. Nonetheless, it is worth mentioning that any progress reported here is very novel and has not been fully investigated, and more investigations are required before new restorative materials can be widely disseminated as a permanent solution to a given clinical problem. Shoji AK, H, Kentaro TGC. Fluoraluminosilicate glass powder for dental glass ionomer cement. 1988. US patent US 4775592 A. http://www.google.ca/patents/US4775592.